"Things are never as good as they seem." Profile: Crankcase is a wheezing, whining ingrate who is about as welcome as a rash of rust-rot, even among his fellow Triggercons. His favorite pastime is complaining about everything and everyone. Nothing is good enough for him. He delights in the misfortunes of others. Apparently, their misery makes him feel superior in some misguided, muddle-headed way. This juvenile "I'm-better-than-you-are" need in him stems from his youth, before he became a Decepticon. At that time he was little more than a gangly collection of circuits and servo-motors, performing a menial janitorial function in the Fuel-Spill Section of the Ministry of Energy and Nutrition on Cybertron. More robust fellow workers mocked his feeble physique and bullied him. Feeling alienated from and hatred of established society, Crankcase eagerly joined the Decepticons when they began their war against the Autobots. Megatron himself rebuilt Crankcase to give him increased bulk and strength. Crankcase's first action in his new body was to attack the Ministry of Energy and Nutrition. Millions of years later, the fuel spill he caused has yet to be fully cleaned up. Abilities: Crankcase has a vast data storage capacity. His memory can contain 400 trillion trillion bits of information, which are encoded in patterns of light within microscopic crystal matrices. His titanium-steel alloy armor is resistant to all explosive shells having yields of ten megatons or less. Twin infrared probes can penetrate and analyze most unshielded electrical circuitry. He is armed with two high-impact laser blasters and a distortion modulator that scrambles internal electrical signals within most targets that it hits. It can effectively cause temporary paralysis or uncontrollable, spasmodic seizures within a victim. He transforms into a ground vehicle with the same armor and sensor properties. In this mode his maximum speed is 90 miles per hour and his range is 480 miles. 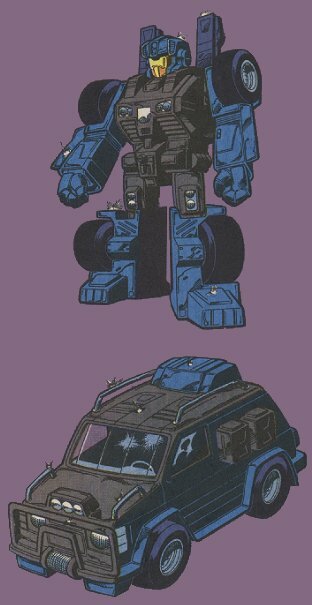 Weaknesses: In vehicle mode, Crankcase is prone to frequent tire blowouts. On rare occasions, a sharp blow to his head module causes small data dumps in different areas of his memory - a form of amnesia similar to the type found in some humans who have undergone similar trauma.